Monday 5 February 2018 an AGM was arranged for Monday 26 March 2018. At this meeting the new Constitution was introduced and Membership Cards issued to residents who had completed Application Forms and paid the first annual subscription of £10. Voting was carried out to appoint Andrew Lawrence as Chairman. Louise Young as Secretary and Ilga Parker as Treasurer. Conversation took place about the sort of Events which we could run during the year. There was great concern about the speeding of traffic through the village and the constant bypassing of the chicanes. The chairman has made good contacts with the Police after the spate of crimes last Autumn. 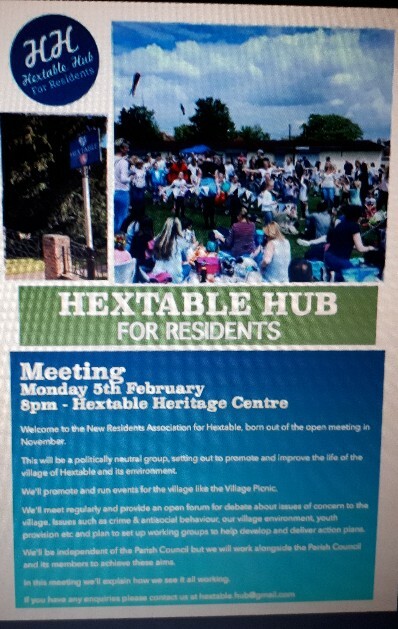 The next meeting for the new Residents Association, to be called the Hextable Hub is scheduled for Monday February 5th at 8 p.m and will be held at the Heritage Centre. and view Lizzie Fogarty's posts. At this meeting on a cold night attended by close on 40 residents, the Chairman for the evening Andy Lawrence raised a number of proposals which Louise Young has fully reported on Facebook Hextable Village Life Group. For residents not members of the Group the following resolutions were agreed. 1) That this meeting elects Andy Lawrence, Lizzie Fogarty, Louise Young, Rose Jackson, Andy Proudlove, Christine Proudlove, and Ken Grist to be the officers of the association known as Hextable Hub for Residents. 2) That this meeting instructs the Officers to take the steps necessary to open a bank Account, appoint auditors, and take such other steps as may be necessary to form the Association known as Hextable Hub for Residents. 3) That this meeting instructs the officers to develop and adopt a constitution for the Association known as Hextable Hub for Residents. 4) That this meeting instructs the officers to seek and accept membership applications to the association known as Hextable Hub for Residents and to collect membership subscriptions. 5) That all residents of the Parish of Hextable, together with a single representative of any business or organisation, may become members of the association known as Hextable Hub for Residents. and that the initial membership fee shall be £10. 6) That, beyond the present meeting, only members of the association known as Hextable Hub for Residents shall be entitled to vote at meetings and that decisions shall be made by a simple majority of the members attending any meeting. A date will be set for the next meeting and once agreed will be publicised as widely as possible.